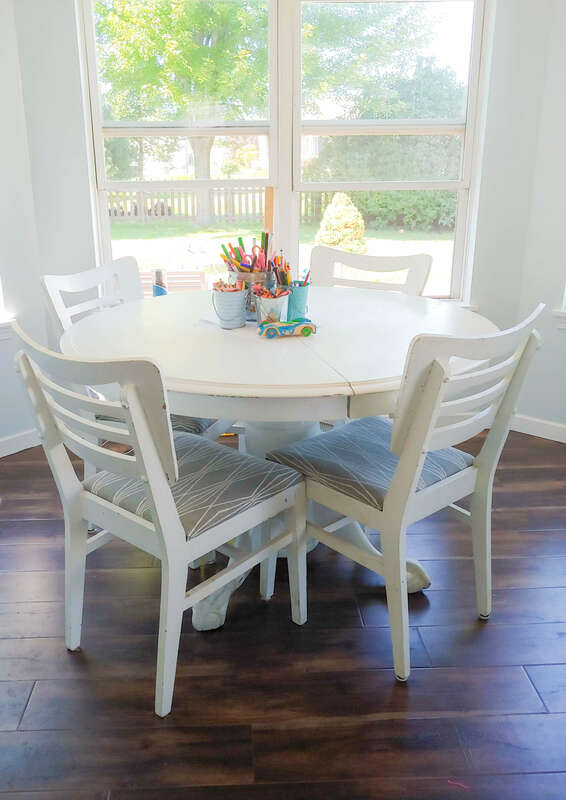 Today I am sharing all about the Sun room updates- creating a homework space, storage & redoing chairs I have done recently. 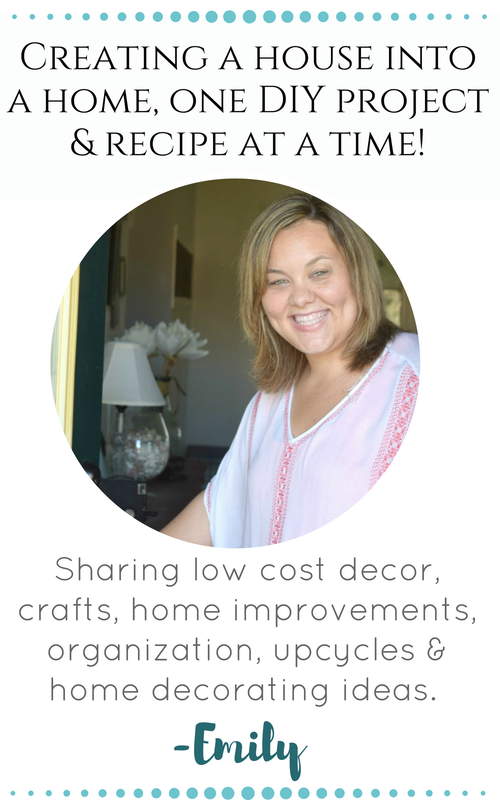 On Friday I will be sharing my Fall home tour, I am so excited with how things turned out. Simple, subtle and casual is the Fall theme that came about this year. 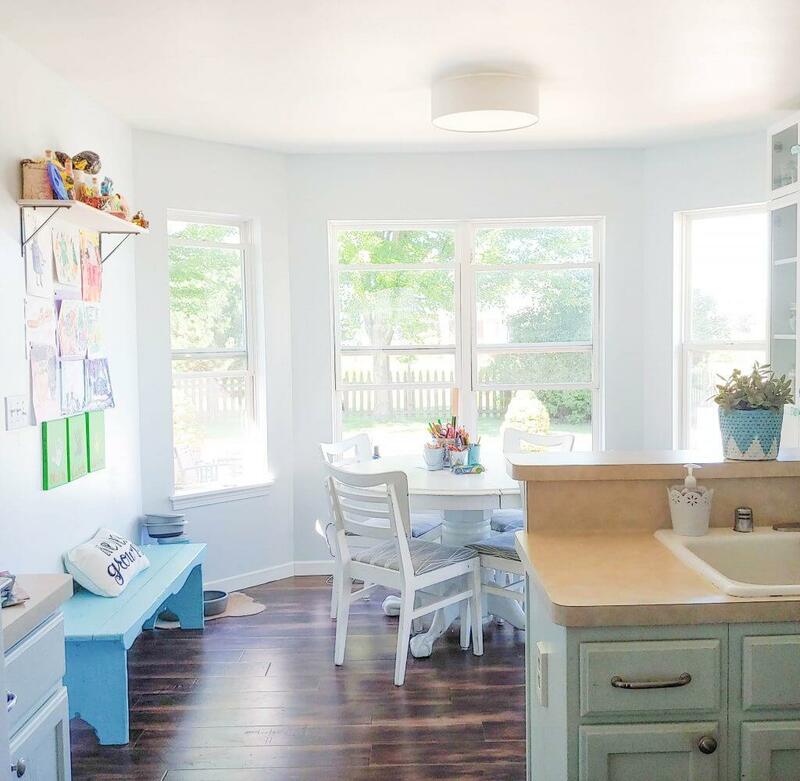 Anyways, for today I am talking all about the sun room we have off of the kitchen. This space has gone through many, MANY changes. 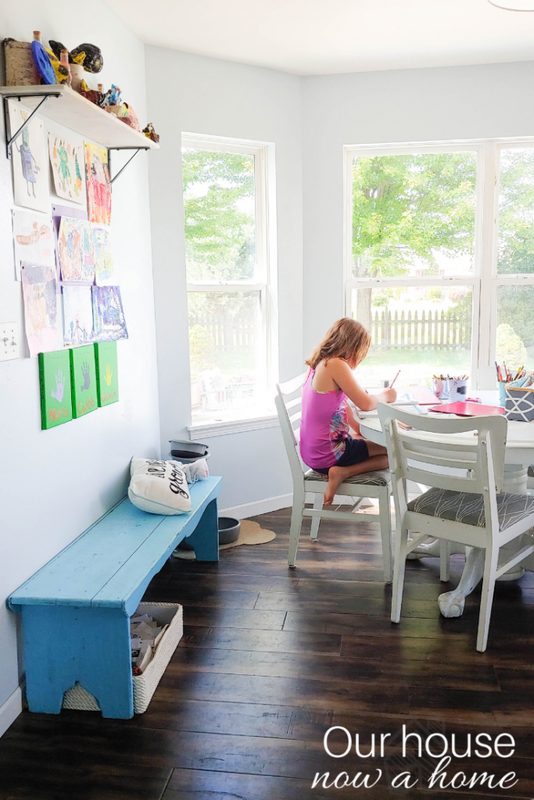 It was a play room, dining room, extra kitchen space and most recently became my kids homework/art table spot. We are lucky enough to have some “flex” space in our home. 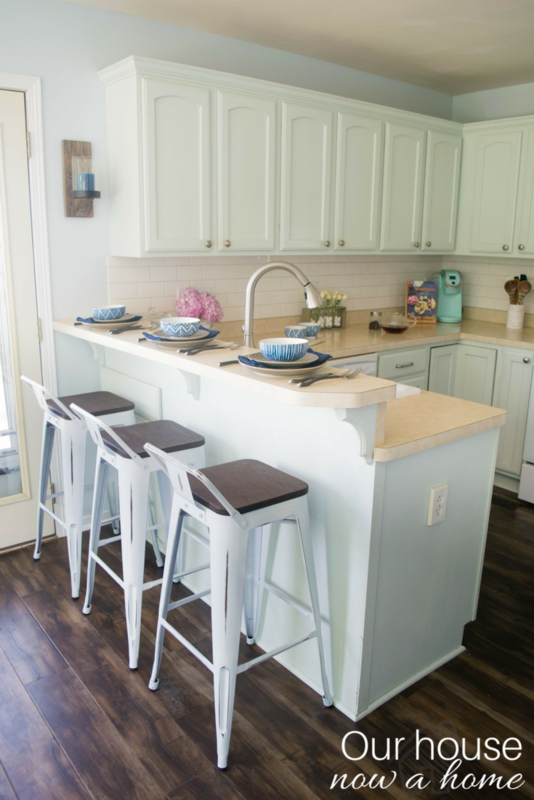 We have our kitchen, living room, what is typically the eat-in kitchen (our sun room) as well as a formal dining room. A few months ago I changed things up and utilized the rooms differently, really stressing the flex aspect of a open-ish concept home. I created a family room in what was the formal dining room. Having a large formal living room and then moving the dinner table into the eat-in kitchen area. Creating just one dining room and two living rooms. This space worked great for us, but my kids wanted an art table back in the main living area. I had moved all of their art supplies into their bedrooms but they were missing the communal art space. So I had to somehow squeeze in a complete art table into the main living area again. With some finagling I added the dining room into one side of our long formal living space, turning it into a great room. Then I moved the art table into the sun room that was formerly the dining room. 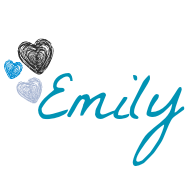 Are you following along? But, we replaced the older and broken art table. It was shorter and the bottom of it has snapped off, so we needed something new. I had a dining room table that had been our main table for years until we made our farmhouse one. This table has been in the basement, I was planning to sell it. But I found a better use for it, us! This has become our new art table. I replaced the chair cushion fabric. 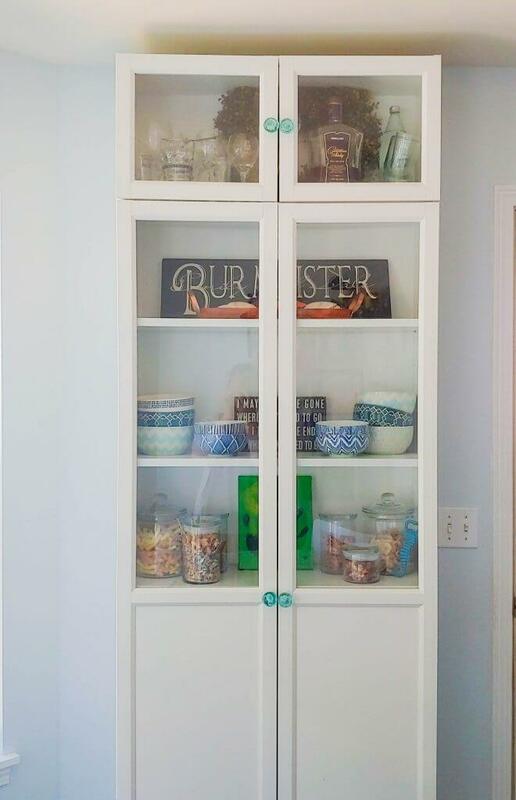 This is such a simple and quick furniture redo. The fabric has seen better days, these chairs and dining set got us through the baby and toddler phase of life. That is a rough, messy and stain crazy part of life. The fabric I picked out was no working anymore for me, nothing wrong with it. Just a little too country for my current taste. When we first purchased this house I wanted country everything. I have since adjusted my decorating style to be more rustic and bold. 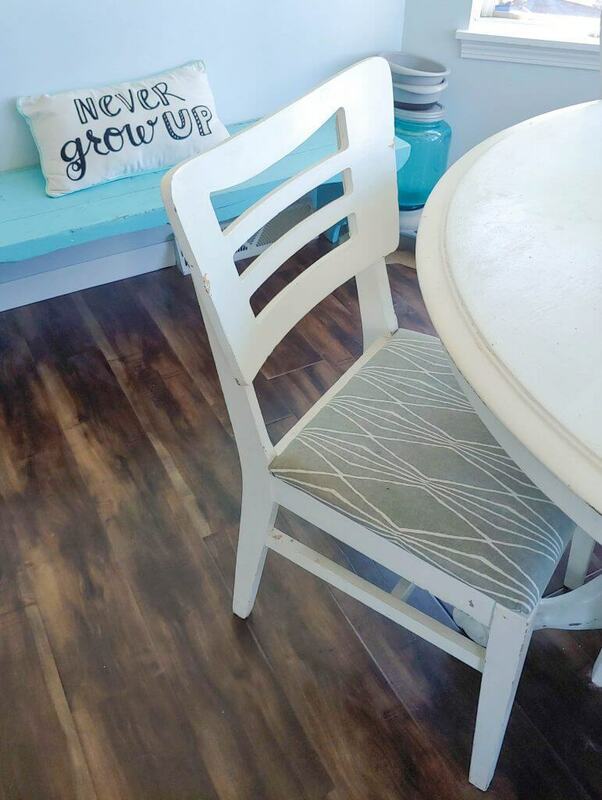 I had this fabric I picked up on clearance and knew it would be perfect for these chairs. 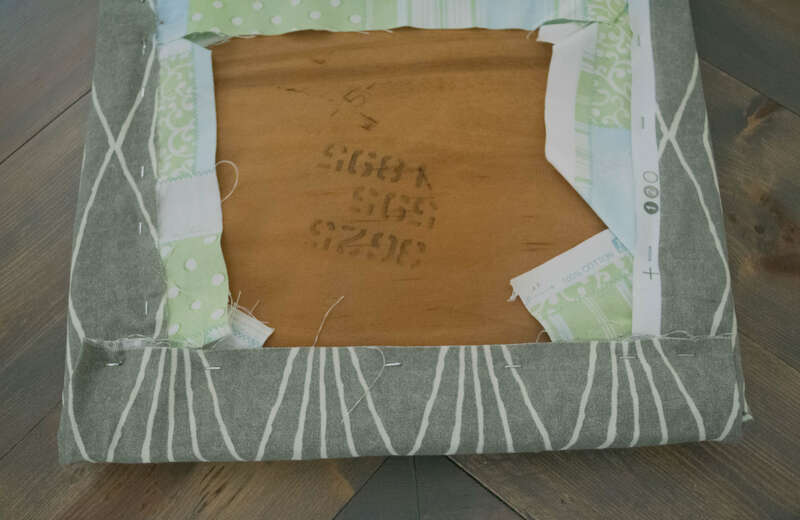 Replacing the chair fabric is really simple and low maintenance. 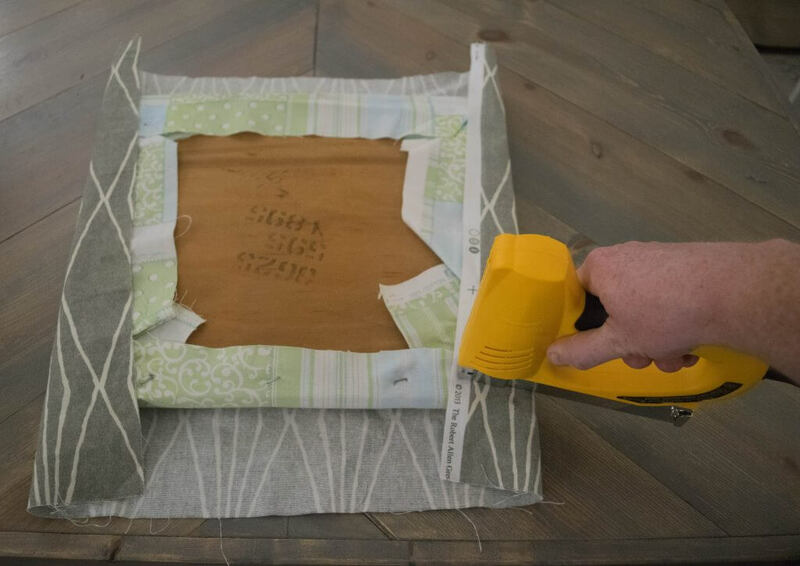 This just might be the easiest DIY project steps I share, but here we go. 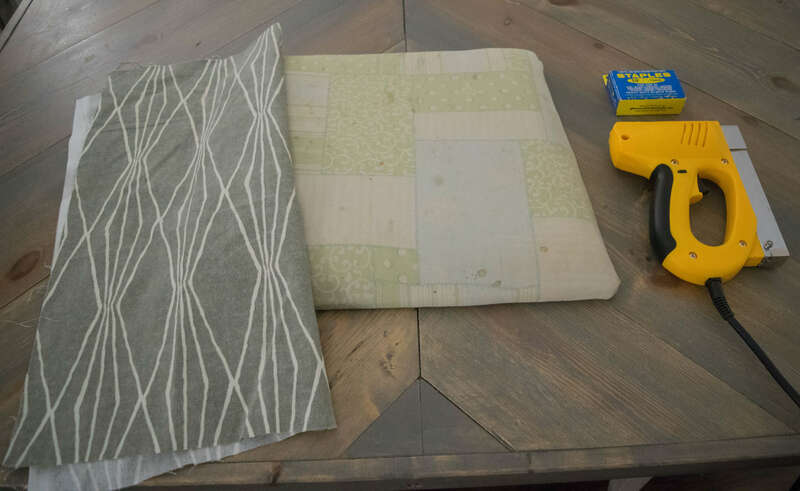 Lay the cushion upside down on top of the new fabric that is also upside down. Because I knew the history of these chairs and the seat cushions were not too old I did not replace the cushion itself. Using a staple gun and then stapling along the sides. I always do the straight sides and then fold in the fabric on the corner last. Done, this chair redo was quick and painless! 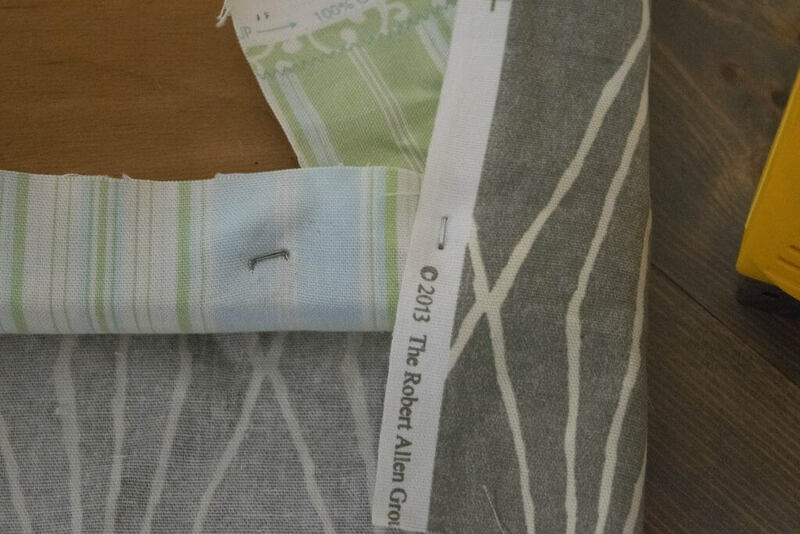 This geometric patterned fabric is more along the lines with my current decorating style is. 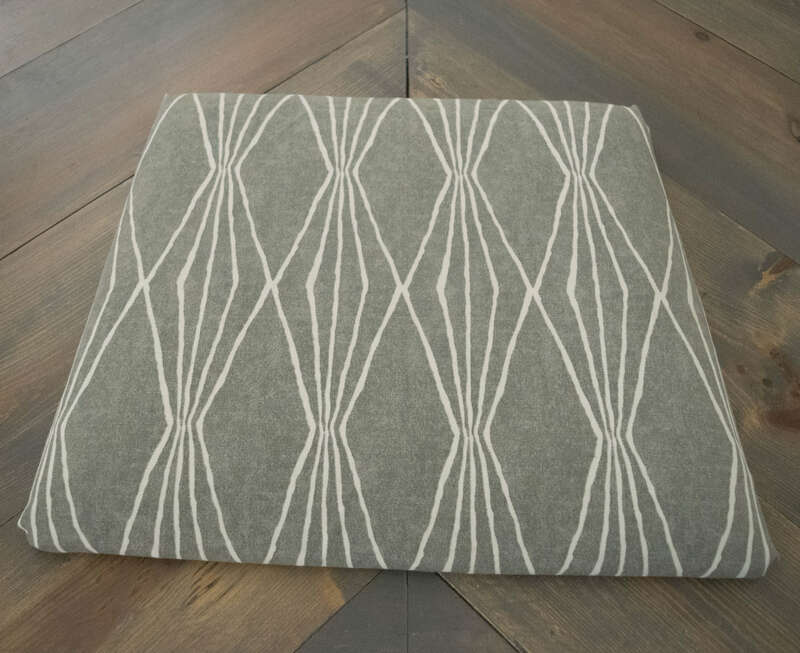 I am all about gray and bold geometric patterns. With the darker gray it is also more likely to hide any stains that will inevitably happen. The table and chairs will need a new coat of paint eventually, but I figured with this being the kids art table I am fine leaving it as-is. This table will need a entire new finish once my kids are done creating on it. 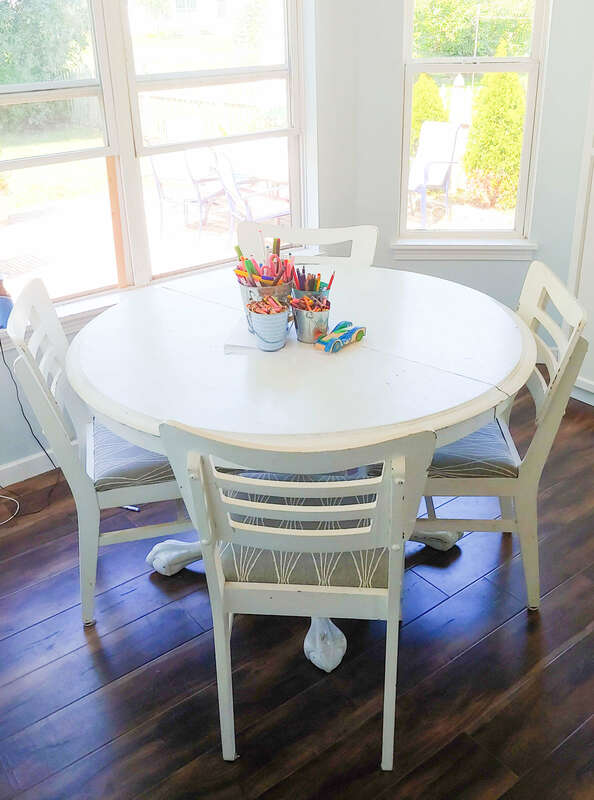 Combined with the new art table, the kids wall art display and a cute bench this feels like the perfect place for my kids to create! My family functions so well with multiple living spaces. 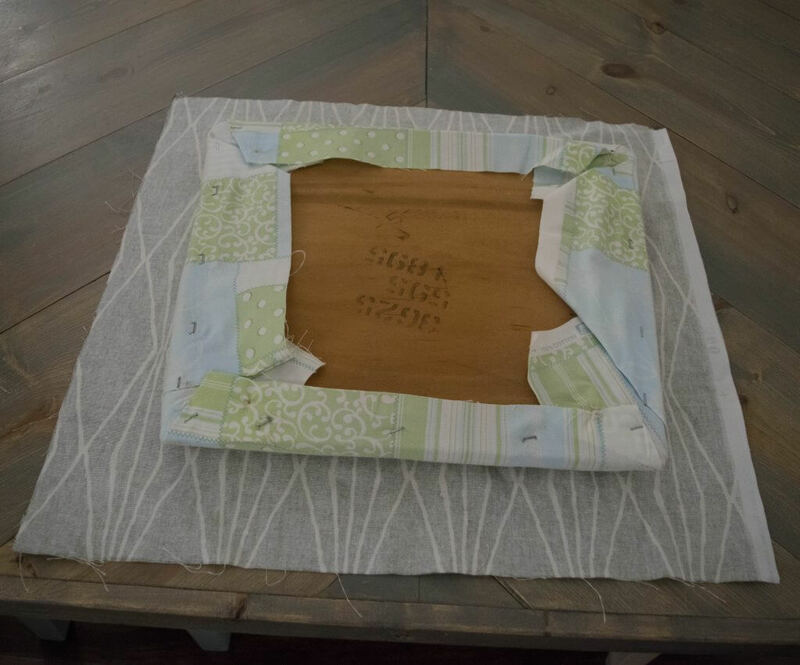 Sometimes I am making a craft project using the big dining room table, now we have this secondary table that we can all sit at if needed. The table actually has a leaf I can use to extend it and also two other chairs that are kept stored away. This sun room has become my kids go-to homework space. My oldest child Nora just started 5th grade and the homework is no joke for this grade. We went from maybe her having homework twice a week to homework every night. It is still very manageable and typically only about 45 minutes of it. But it is a lot more involved. She needs a place to be able to get away from the noise of the house to work. We have a rule about the kids only using a computer in the main living areas, so her taking the computer in her bedroom to do homework is out. But if my boys are in the living room, maybe Dale and I are talking in the family room or I am doing a project at the dinner table, she can easily go into this room and get her work done. It has become the perfect homework spot. That is one huge benefit of having a little extra wiggle room with a flex space. 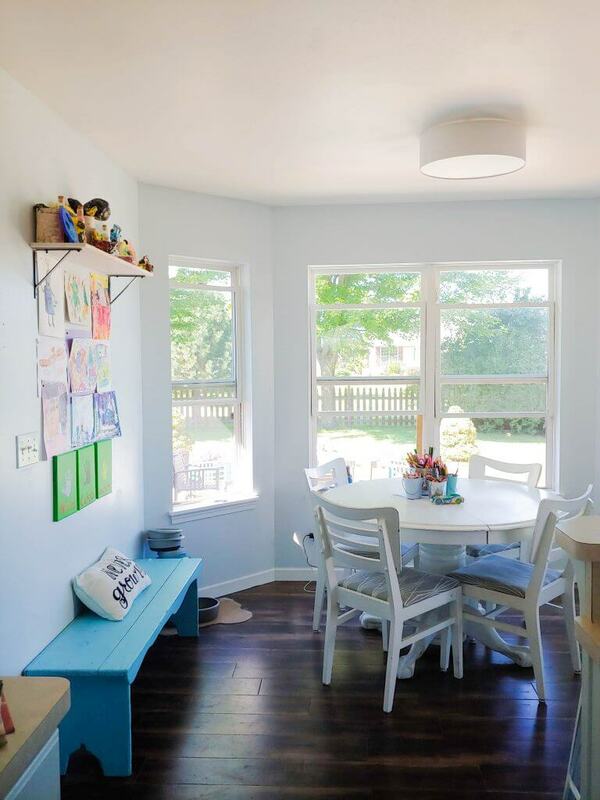 As your family evolves, kids age and the rooms need to evolve as well. 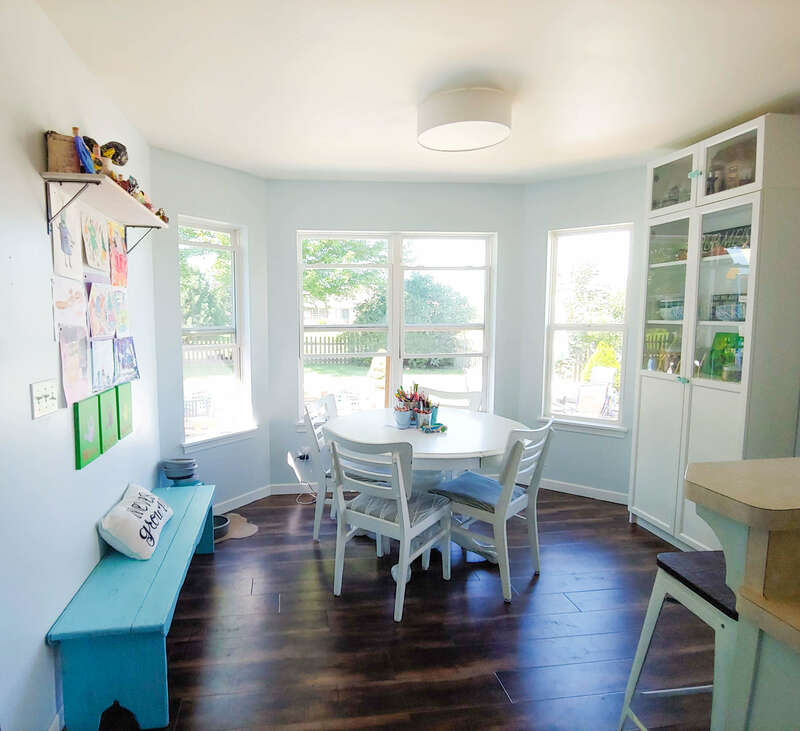 A playroom becomes a homework room which may become a game room for teenagers or an office space. 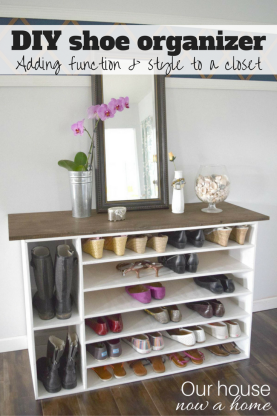 Thinking outside of the box with your home and what you have can open up a whole new option and use of a space! 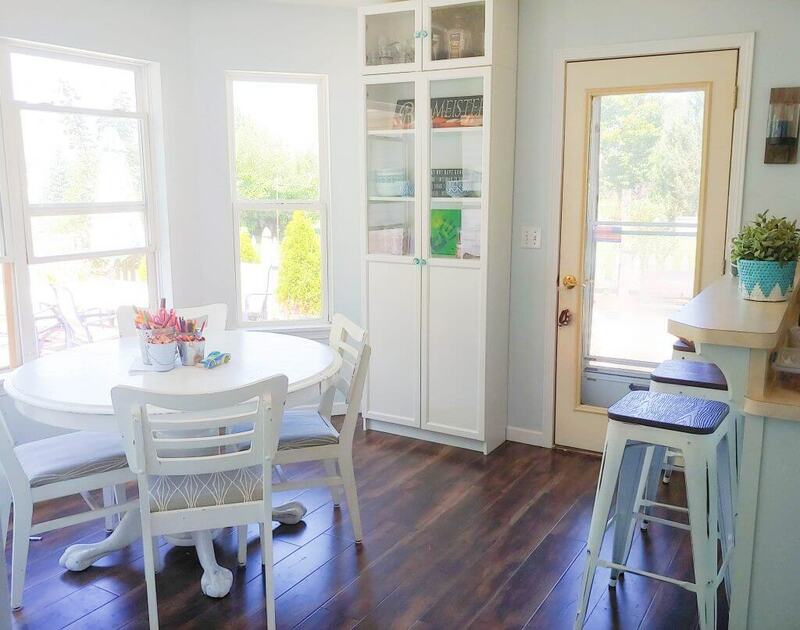 In this sun room update we also have an Ikea cabinet that is an extension of the kitchen. We keep extra bowls, any liquor we have, and then a bunch of snacks in here. 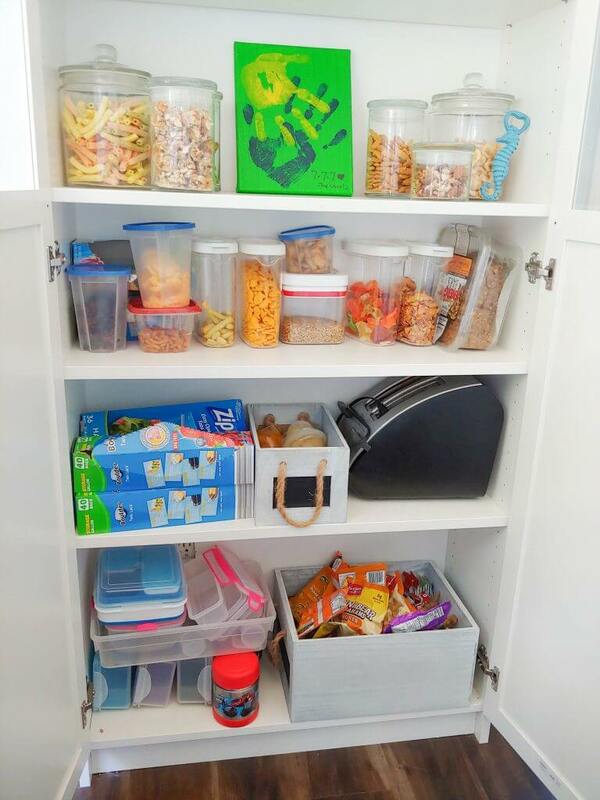 This is my kids snack pantry. They come here for an after school snack or to grab one to take to school. We have one tiny pantry in our kitchen that does the job most of the time, but moving the snack foods here has lessened what I had to store in the pantry in the kitchen. It also allows for better flow of traffic in the kitchen. We suffer from small-kitchen-itis and all three kids crowding around after school with their lunch boxes, papers and also frantic for a snack means there is bumps and frustration. Nothing like grouchy kids the second they get home from school. 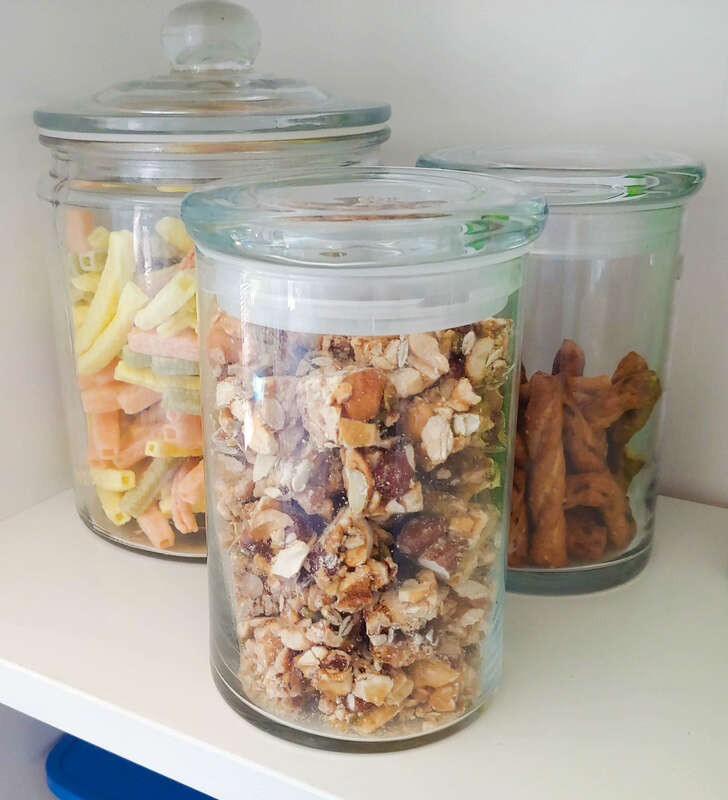 We have invested in some glass and plastic containers that we store the food in. This allows it all to stay fresh longer, the kids can see what is in them and I know when we are running low on something by just glancing in the pantry. 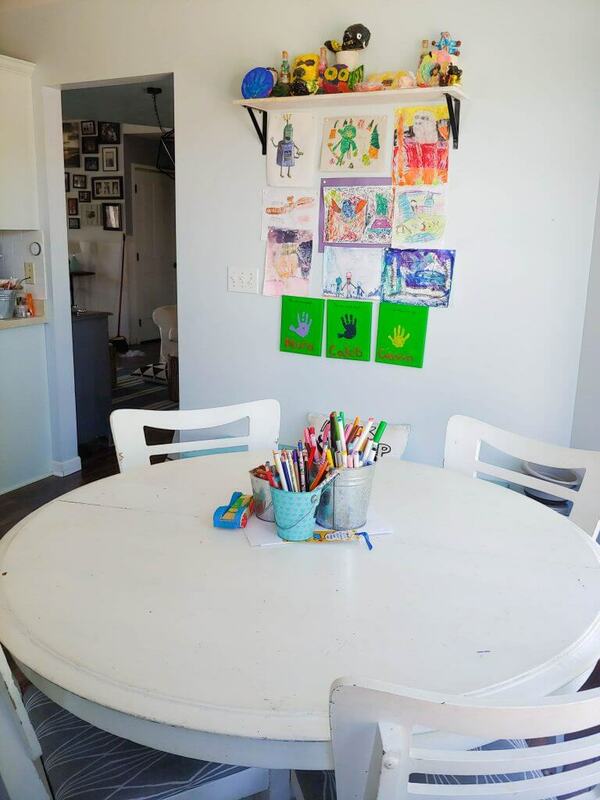 By changing out the art table to an actual dining room table this space instantly became a room we can all use. We sometimes eat lunch here, when it is not covered in glitter, stickers or random pieces of paper. The previously mentioned homework area has been a game changer for us in the evenings. Just last night Nora was in here working on a slideshow for school, Caleb was doing math homework at the art table as well. I was reading with Gavin in the living room and Dale was on the phone in the living room. We all had plenty of space to spread out! Aside from lottery winnings we will not be adding any actual square footage to our home so I have gotten creative to maximize the home and square footage we do have. 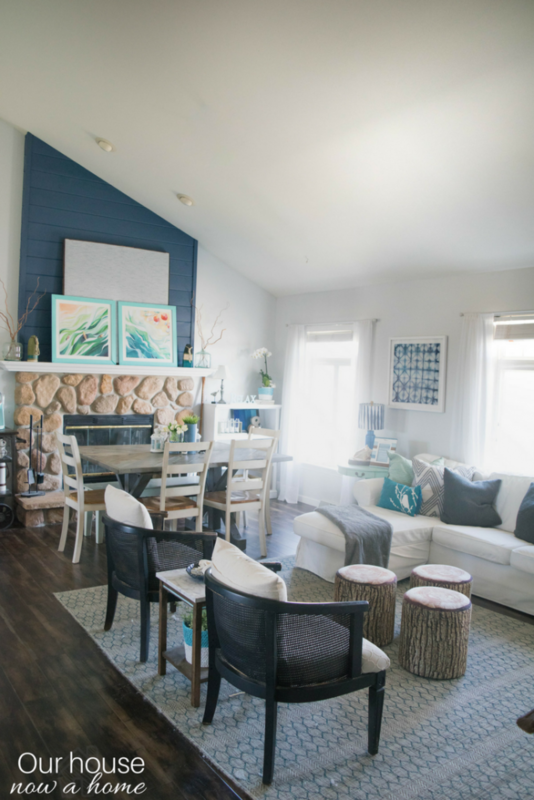 This sun room update is just another example of that function and change I accomplished! I was able to add storage for food appliances and food containers. I added a new homework space that works to minimize any distractions in the evenings. The table encourages that creativity that my kids still crave. I has assumed with them being 10, 8 and 7 that the time of an art table was dwindling, but I was wrong. My kids grab anything from the recycling bin to cut up and draw on. 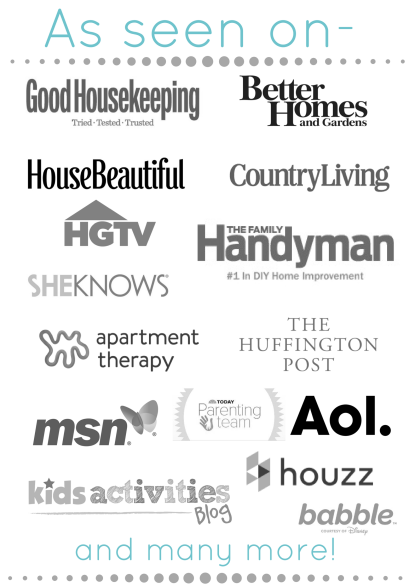 They make stories, mazes, and so many projects. This art table and my kids still have a lot of creativity left in them! 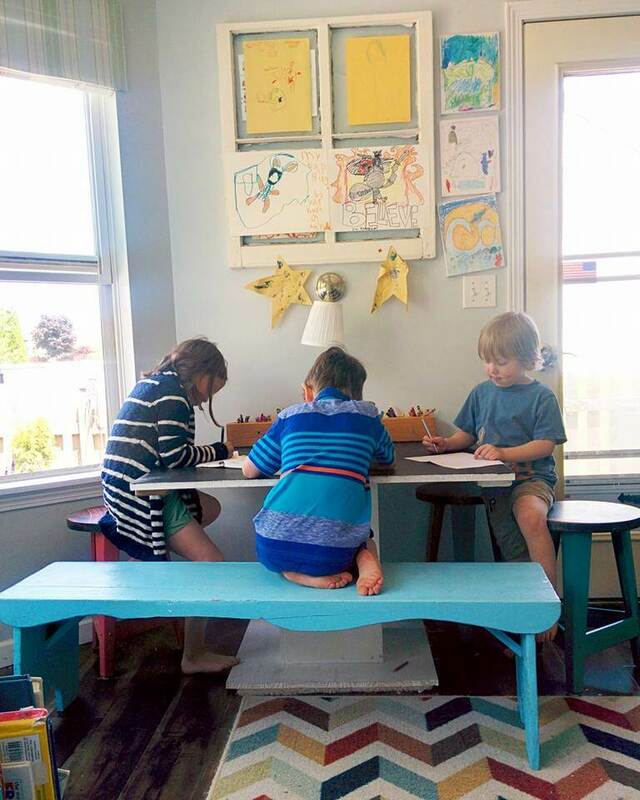 The evolving life of raising kids means right now we needed a communal homework area. But the functional side of things with a family of 5 means having another eating area comes in handy too. The fact that I was able to squeeze in so many functions for this one tiny sun room makes me excited! I love adjusting our home to make it be better for us. 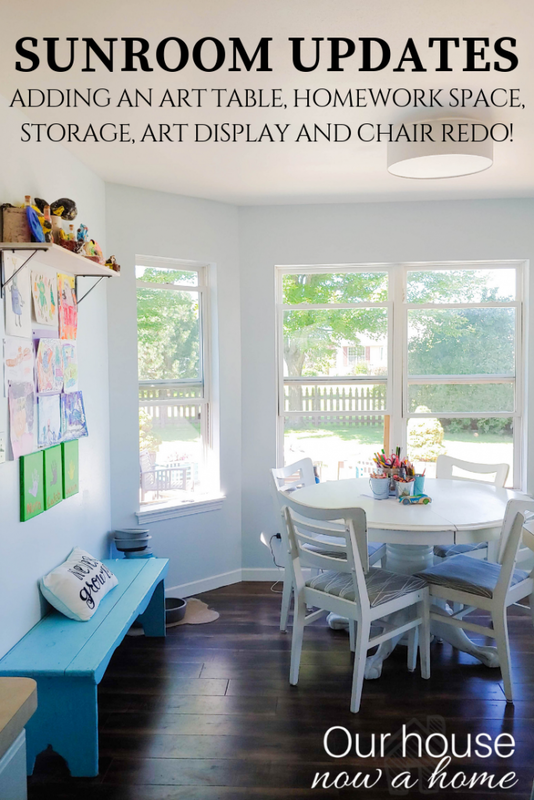 This Sun room updates- creating a homework space, storage & redoing chairs is just another adjustment to what we need for our home currently. In two years it will most likely become a different space, and again a few years later. Our life is not stagnate and I have come to realize making our home work for us and the stage of life we are in means the house will not be stagnate either. We are in the process of getting bids on a sunroom addition, so this came at the right time. I love everything you do! It looks so bright and light – beautiful! A sun room would be such a lovely addition to our house! This one looks so bright and inviting. I might even do homework in this room. Haha! Oh my gosh your house is absolutely gorgeous! 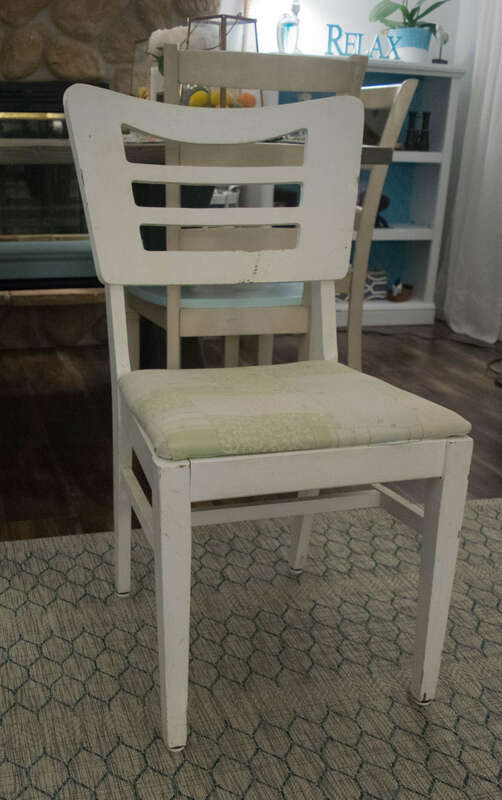 I love the idea of just refinishing a chair. 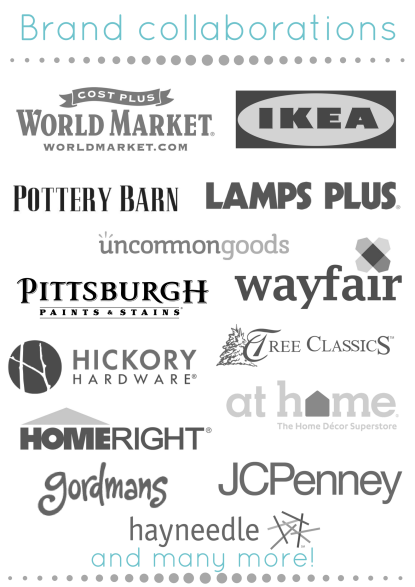 It makes it look so different without actually spending hardly any money! I love how this turned out! I am all about the natural lighting. I wish we could have a sun room. It would be the perfect place to read. I love how bright and sunny your room is. What a cheerful space! 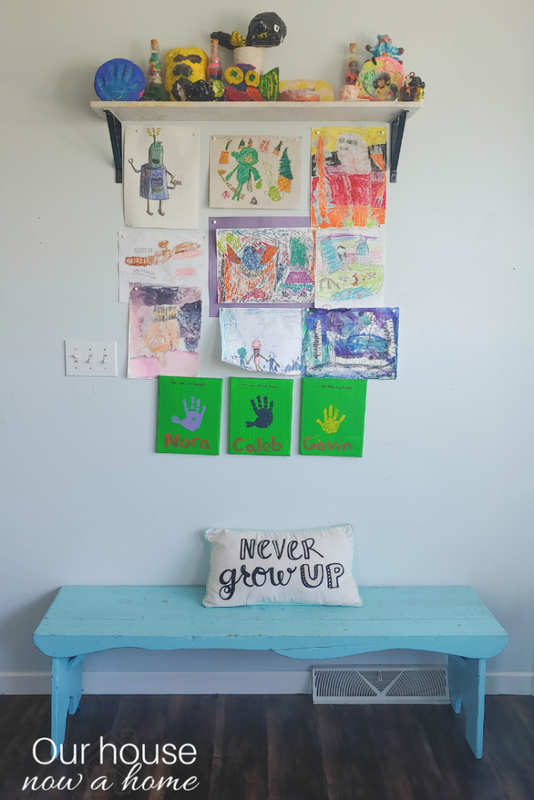 I have an art wall of my kids art just like that and I think it’s such a cute idea. I love how it is looking! I would love to spend all my time in that room! It is coming along beautifully! 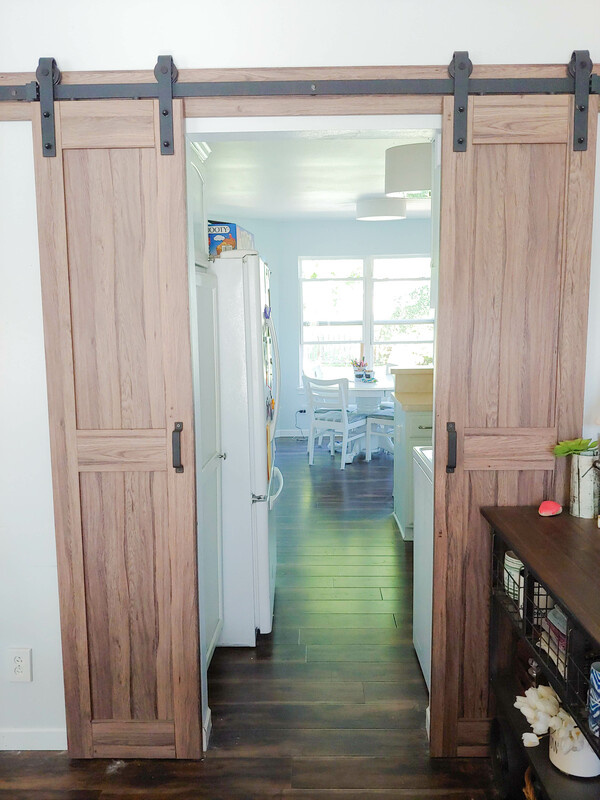 I would like to do a barn door type in my master going into my bedroom. I think they look incredible. I love yours. What a great redo! I love that you redid the chairs. 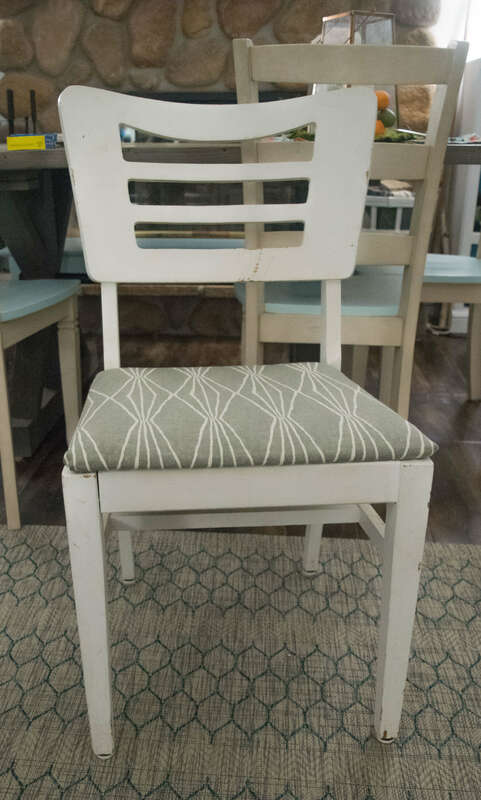 My dining room chairs are horrible, and you’ve given me hope! I wish I had a sunroom – it really is a great addition to the house. 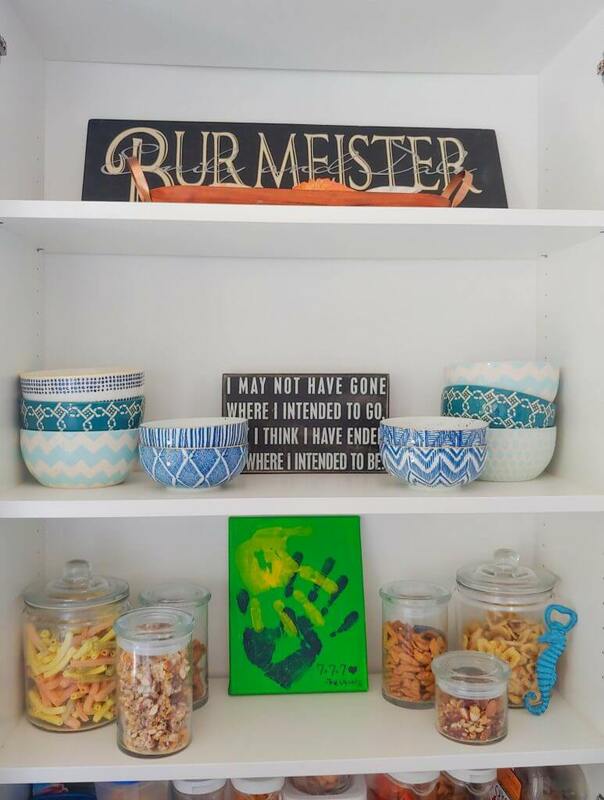 What a great use of area in your home !I love how bright and organized everything is!! I do love your set up it is well organized. 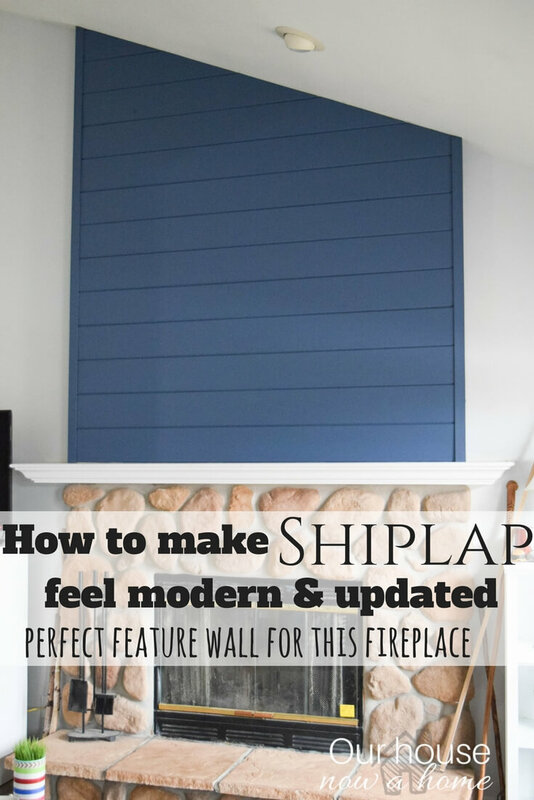 Nice ideas to renovate my new home. 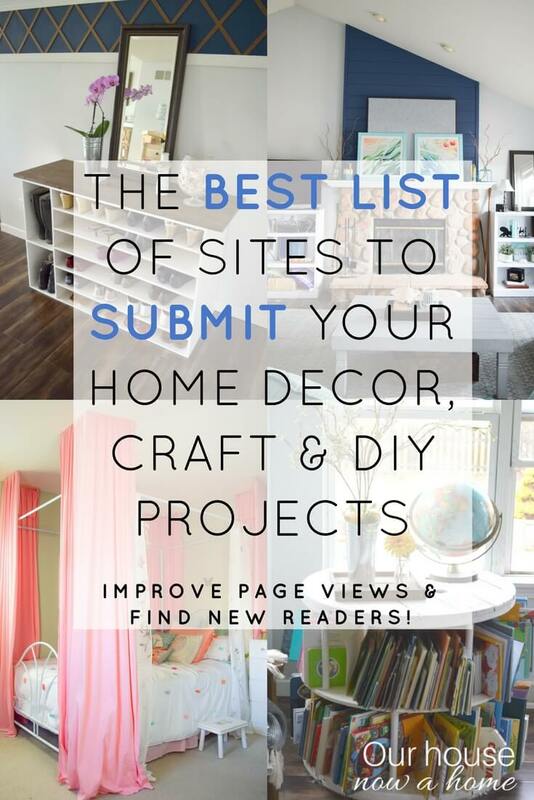 Your house is both beautiful and functional! 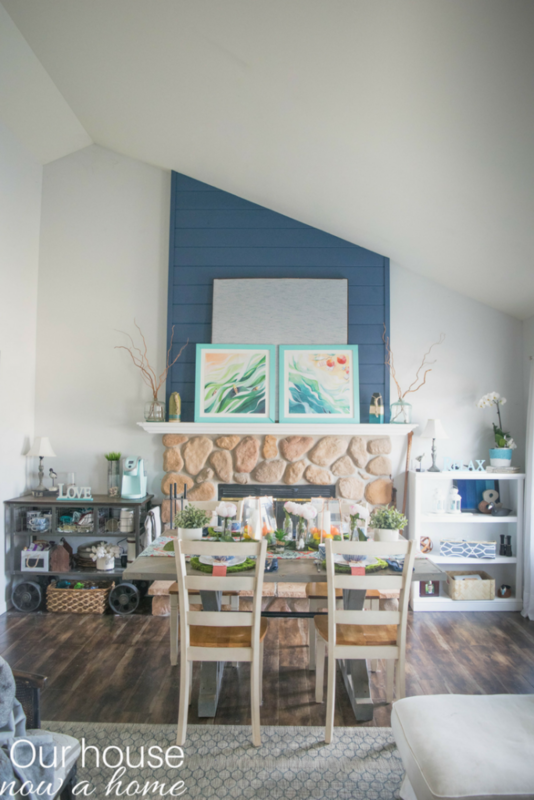 Totally inspired by your decor and how you put everything together! Your house is so nice and I love the design. We need a sunroom addition to our house. I feel like we need more sunlight in on the top floor. You have a beautiful house. And I love this wonderful and comfortable room that you updated using easy and cheap ideas! Your sun room is gorgeous and I love how your refinished your chairs! What a great light and fresh look. Perfect for homework! Love this! I want to redo my own sunroom. It’s got amazing light, but it needs to refresher!